Those of us who work for content marketing agencies and others who are responsible for developing new content for our own organizations share a common challenge. We know how difficult it can be to find balance between intrigue and usefulness. We understand that it is much easier to talk about or simply develop a tool than it is to create a talkable tool. Meanwhile, there is a realization that we need to develop a hybrid content marketing solution – one that is social and has substance. I liken it to the different kinds of people we knew as children in school. Some kids in the class were beyond loquacious and friendly but struggled with their algebra homework. Then there were the children who were freakishly bright but never really engaged at school dances. But do you remember your class president? Chances are she was funny, smart, engaging and helpful to her classmates. She possessed a great combination of qualities owned by the socialites and the bookworms. 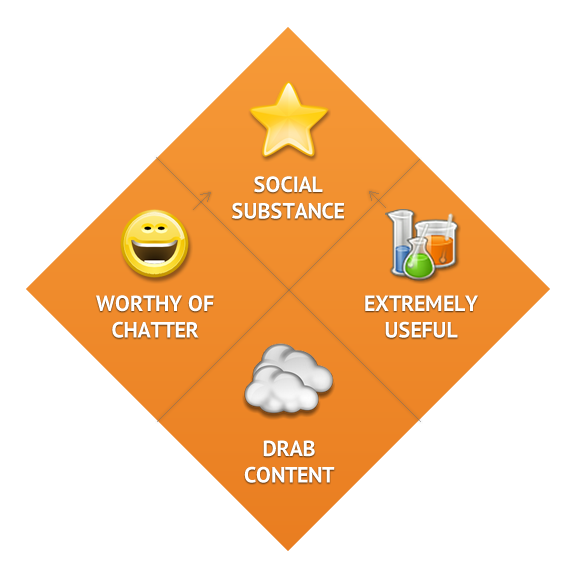 Perhaps you already have some very talkable or useful content that needs a boost to attain social substance status. Here are some examples of each scenario with some ideas to get your content to the next level. Talkable content lacks staying power. It’s interesting for a moment in time, but does not really solve a problem or purvey a sustainable solution to a common issue. Answer common questions. Does your website have a FAQ section? Why not translate that into useful, shareable content? Solve lingering problems. Has your customer service department reported an increased number of complaints in a certain area? Solve trending trouble spots by creating and promoting helpful content. Ask your consumer base what they need. What better way to find out what appeals to your customers than simply asking them. One of the few drawbacks to useful content is that it can lack a universal appeal. It solves one person’s problem in a quick and dry fashion without any reason to share its value and benefits. Typically utilities associated with your brand are very good, but they can often by so much better by exciting the attention of a wider audience. Make your content human. Sometimes utilities can fall flat if we don’t offer a way to show how they can and have impacted others. Provide testimonials and attach real stories to your utilities so your audience can identify with their purpose. Add bits of entertainment, humor, fun. Is your content just boring? Give it elements that people would actually want to share and talk about. Simply add the ability to share. Creating something useful is more than half the battle. Often times, we just forget to let our audience spread the word. Allow and encourage your customers to share. By combining the effects of content that is worthy of chatter and extremely useful, we can create a harmonious content marketing program. Above all, try to avoid creating drab content that lacks both utility and appeal. What kind of things are you doing to create social substance?